Charlie’s Pride offers a tempting variety of delicious homestyle entrées, all expertly prepared from the highest quality whole muscle meat. Perfectly seasoned and fully cooked, they’re ready to heat, serve and enjoy in just minutes. Serve with your favorite side dish and you have a complete meal that will please the whole family. Charlie’s Pride Entrées—dinners done deliciously quick and easy. 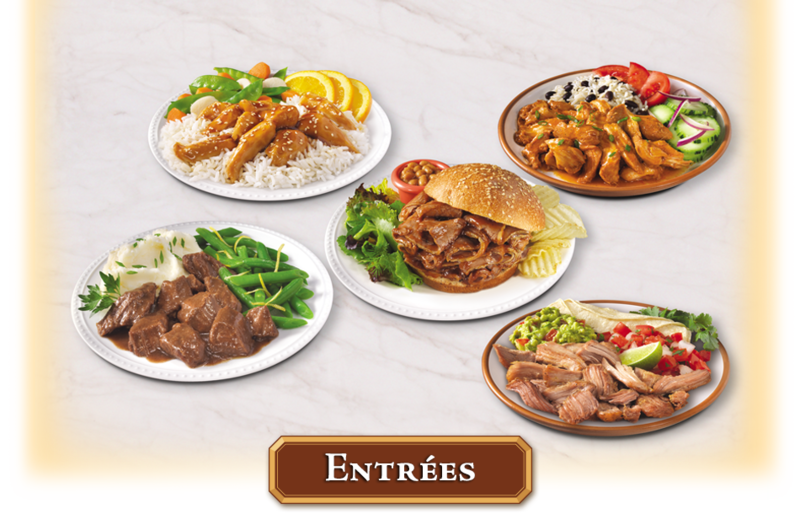 All of our entrées are available in 5 lb foodservice bulk packs, vacuum sealed for freshness. Custom retail or foodservice packs are available upon request. Tender pieces of seasoned beef in a rich and savory gravy. Available in 5 lb foodservice bulk packs. Tender pieces of seasoned beef in a rich burgundy wine sauce. Tender slices of beef in our tangy, award-winning barbeque sauce. Tender shredded pork in our tangy, award-winning barbeque sauce. Tender, lean breast pieces in a rich teriyaki sauce. Tender pieces of authentically seasoned oven-roasted pork. Tender pieces of pork simmered in a mildly spicy green chile sauce. Tender, lean breast pieces simmered in a mild chipotle sauce.